Unidentified Carte de Visite c. 1860s-1870s? found with Anna Fenton's photos. This one is 2.5" x 4.25", brown-toned, matte surface, on thin stock with rounded corners. The format is known as "carte de visite" and it was widely used between the 1860s and the 1890s. The first form of cheaply available photographic print (as low as 8 for a $1), cartes de visite were were small paper-based prints that were glued to cardboard mounts, often preprinted on the reverse side with the photographer's name. The properties and style of the mount, the printing and the photograph are helpful in estimating the date the print was made. Most characteristics would date this to the 1860s (in fact, a 19th century photo expert suggested the 1860s), but the rounded corners of the mount may bring it into the 1870s. 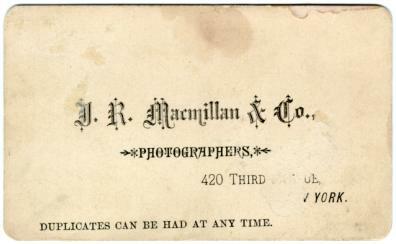 On the back is the imprint J. R. Macmillan & Co., Photographers, 420 Third Ave, New York. Given the early date and the location, this is most likely a son (or daughter?) of Matthew Fagan's older brother Eugene. 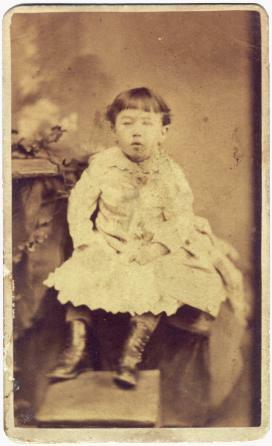 Eugene, who lived at several locations on the same block as the photographer, had his first offspring in 1868.